Hun Sen, who came to power in 1985 in a country still plagued by civil war, has cracked down on dissent in the run-up to this year’s poll, pressuring civil society, independent media and political opponents. That left him with little competition and no serious challengers. 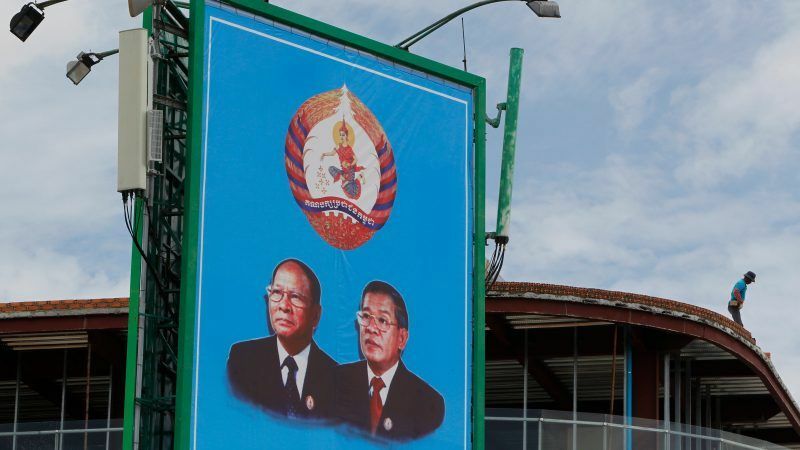 Cambodian People’s Party (CPP) spokesman Sok Eysan told AFP late Sunday they expected to win “over 100 seats” in the 125-seat parliament, citing preliminary figures from the National Election Committee. Hun Sen, 65, a one-time defector from the brutal Khmer Rouge regime, has pointed to stability and growth as the fruits of his rule — a message that resonates with his base. “Compatriots have chosen the democratic path and used your rights,” he said on his Facebook page after polls closed in an apparent swipe at the opposition, which called for a boycott. Voter turnout was 82%, according to the election committee, surpassing the final figure in 2013 of roughly 69% when the opposition took part. But there were also signs of despondency and indifference, and an expert on elections in Southeast Asia said the high turnout was misleading. “With one-party rule election turnout is generally higher, not lower, because the party, in this case the Cambodian People’s Party, relies on voter intimidation more, relies on vote buying more, and turnout should be inflated that way,” said Lee Morgenbesser from the school of government and international relations at Griffith University. Pictures of spoiled ballots circulated on social media though they could not be independently verified. AFP correspondents saw dozens of blank ballots set aside during counting. “I did not go to vote. I slept at home,” said Khem Chan Vannak, a former commune chief elected with the now-banned opposition Cambodia National Rescue Party (CNRP). Western governments withdrew their assistance from the election, citing its lack of credibility. Nineteen small — or hitherto unknown — parties competed against the ruling CPP in the absence of the CNRP. But analysts say they are too obscure or new to make a meaningful difference. The CPP has won every election since 1998. The opposition, whose leaders are in jail, underground or in self-exile, urged a “clean-finger” boycott as the only safe form of protest, a reference to the ink applied to people’s hands after they vote. Official results are expected on 15 August. More than eight million voters registered for the sixth general election since polls were organised by the United Nations in 1993. At the time the country was emerging from decades of war, including the Khmer Rouge years from 1975-79 which killed a quarter of the population. Hun Sen was installed aged just 32 as national leader during the Vietnamese occupation of 1979-89. But a youthful population angered by corruption and with little memory of the Khmer Rouge era put the ruling party’s longevity in doubt. Their votes helped the CNRP to secure more than 44% of the vote in 2013 and a similar share in local elections last year. But Hun Sen snuffed out the looming electoral threat, accusing the rescue party of being involved in a plot to topple the government and arresting leader Kem Sokha. The Supreme Court dissolved the party in November 2017. “This is a story of how democratic dreams die under the fist of a dictator,” Phil Robertson, deputy director of the Asia division of Human Rights Watch, said. A climate of fear driven by local-level ruling party members has made many reluctant to openly criticise the vote. The election committee, which has been accused of being biased towards the ruling party, said there was no voter intimidation. Hun Sen has maintained his grip on the country through political and family alliances in the police, military and media. He has placed his sons in key positions in what analysts see as an attempt to create a dynasty. The United States and the European Union declined to send monitors for Sunday’s election but Cambodia’s ally China provided support. Sam Rainsy, an opposition figure who lives in self-exile in France, said the foregone election victory was a “hollow one”. The CNRP appealed to Cambodians not to vote in the “sham election that has no support and is not recognised by the international community”.